Located on 800 acres of rolling hills, woodlands and plains in central Iowa, Harmony Icelandics boasts an intimate stable setting with a 200’ x 100’ outdoor riding area, lush pastures and miles of trail riding. Virginia Croskery Lauridsen owns and operates Harmony Icelandics in Truro, Iowa, where she breeds, sells and trains Icelandic horses. For more than 20 years, Lauridsen has been actively involved in equine activities. She owned and managed a large hunter/jumper facility and United States Pony Club Riding Center; competed on the “A” circuit in show jumping; trained in dressage; and earned her colors with the Moingona Hunt. Since her introduction to the Icelandic Horse, Virginia has become an active competitor, winning the gold medal at the 2017 World Ranking Show in T1 (Advanced Tölt) and T2 (Advanced Loose Rein Tölt) at Léttleiki Icelandics in Kentucky. Virginia holds a certificate from Hólar University in Iceland for completion of Levels 1-3 of the Knapamerki program. Liz Appel has always had a passion for everything horses and now serves as the barn manager for Harmony Icelandics. Liz has a bachelor's of Animal Science degree from Virginia Tech, where she rode on the intercollegiate team. During summers she worked at a well established thoroughbred prepping farm outside Charlottesville. With 25 years experience as an equine Practice Manager, equine midwife, horse owner and avid foxhunter, becoming barn manager for Harmony Icelandics was a natural fit. Trainer Guðmundur Skúlason (Mummi) is a graduate of Hólar University College in Iceland with a degree in Equine Studies. For the past 10 years, he has been the head trainer at Hallkelsstaðahlíð, a family-owned farm located in west Iceland. 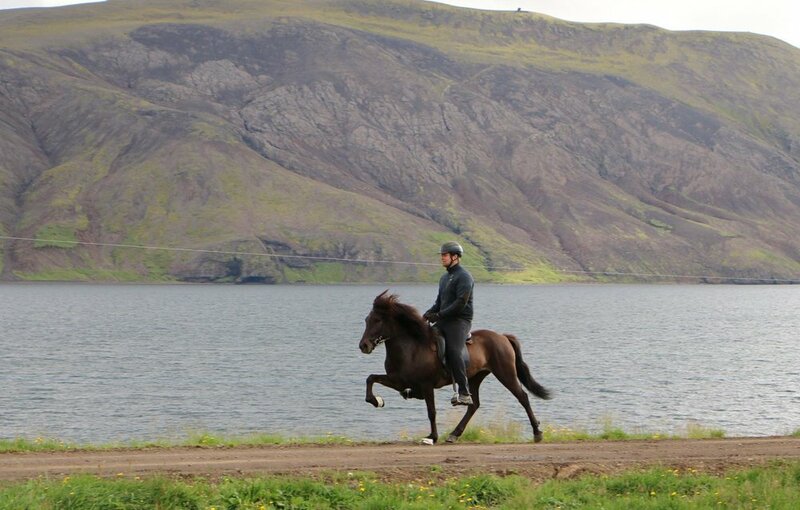 Mummi is in high demand as a riding instructor in Iceland, throughout Europe and in the United States. He regularly teaches in Denmark and Sweden. Harmony Icelandics has contracted with Mummi to visit the farm bi-annually as an advisor and trainer. Additionally, Harmony Icelandics has a standing relationship with Mummi’s farm, Hallkelsstaðahlíð, which proudly aims to produce well-tempered, talented horses which are easy to train and handle.